Futureflue was established initially to manufacture and sell Flexflue, a durable stainless steel flexible flue liner product which is used to reline damaged or old chimneys. Futureflue has evolved from supplying the liner to offering the full chimney repair service from surveying of the chimney through to carrying out a guaranteed repair service. 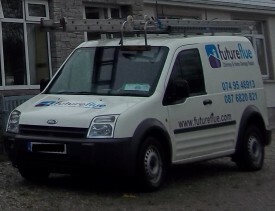 Futureflue offer a guaranteed building repair. A 10 year guarantee on the Stainless Steel flexible liner is being offered by the supplying companies,subject to terms and conditions. Futureflue are used by many insurance companies as a member of their repair panel of contractors to carry out repairs on insured properties which have been damaged by chimney fire. Futureflue have formed a close working relationship with these insurance companies, loss adjustors and private householders. Futureflue are now evolving yet again to meet the needs of our customers with a new service which encompasses, water, fire & flood damage restoration. This is the next step in offering a complete home damage repair solution. Futureflue offer a range of services including. Chimney problem diagnosis & recommendations for repair. C.C.T.V. Chimney inspections & general inspection surveys. Smoke & Fire damage cleaning and restoration. Dry out of water & flood damaged properties.